Its nice and easy to prepare, quick to cook and tastes so, so good. The cashews and pomegranate seeds that finish the dish really make this meal so if you can get hold of them they are worth adding. If you don’t fancy the cashews, simply omit and count as 12sp per person rather than 13sp. 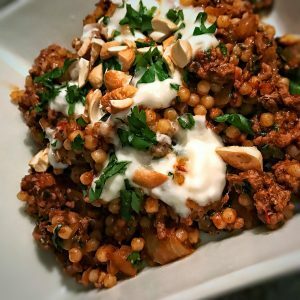 For those of you who aren’t fans of lamb mince, you can make this with the same amount of lean beef mince (5%) and the points are 10sp per serving with the cashews or 9sp without. Spray a large frying pan with 1kal and then fry the mince, onion and garlic for 5 minutes until the mince is browned, then add the spices and fry for another minute. Next add the tomato puree, honey and lemon zest and fry for 2 minutes. Then add half lamb stock and cook on high until the liquid starts to reduce. Add the rest of stock gradually. As it reduces the sauce should thicken and so shouldn’t be too watery. Cook the cous cous according to packet instructions (mine needed to be simmered in boiling water for 8 minutes). Drain the cous cous and add to lamb mixture with the parsley, mint and the juice of one lemon (the lemon you previously zested). Check for seasoning and add more salt and pepper if required. If you are having the toasted cashews, pop on a baking tray and under the grill for a few minutes. Remove and roughly chop. To finish pop the cous cous and lamb into a nice big bowl, drizzle with the yoghurt and top with the parsley and mint you reserved along with a sprinkle of cashew pieces and pomegranate seeds. Laura,where did you get your giant couscous? I simply cant find it anywhere! Thank you Lesley, I’ll have a wee look..
I’ve just made this for the first time and it won’t be the last. Extremely tasty and so easy to make. Made this with lamb and it was amazing. Tried it again after Flex with Turkey mince and chicken stock and it was still amazing. Thanks for another winner.